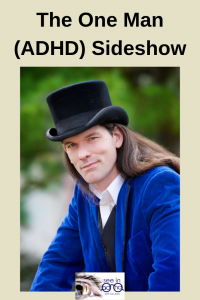 David Darwin is the one man ADHD sideshow. He’s an entertainer, magician, husband and father as well. Darwin stopped by and we discussed getting through public education, parenting, and sword-swallowing as a metaphor for ADHD. Because really, you cannot prove something is real to a person who doesn’t want to believe it. This is true in magic and in ADHD. Visit See in ADHD on iTunes and leave us a review!